The TOP HOP GROUP counts a total of five agricultural companies whose business is hop growing. All are situated in the Saaz growing region and the hop gardens are in the best hop locations of the Podlesi (Underwood) and Udoli Zlateho potoka (Golden Creek Valley) subregions. 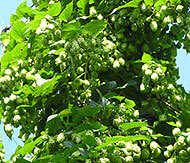 A good location and quality care for hops are guarantees of high quality of the hops grown there. The attached map of the Saaz region indicates the individual hop farms of the TOP HOP GROUP.